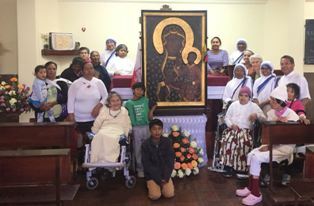 The elderly women's home of St. Joseph, run by the Missionary Sisters of Charity of St. Teresa of Calcutta, received the Icon of Our Lady of Czestochowa last month. This home is in the parish of Tumbaco, 14 kilometers from the city of Quito. Usually approximately 25 old ladies live here. They had the joy of being in presence of Our Lady in the Icon and of learning her history. The center has a chapel, but because of the lack of priests in the Archdiocese it is difficult to celebrate daily mass. 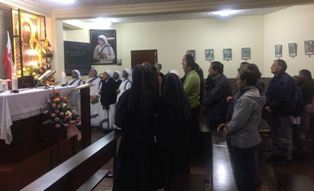 Therefore, the sisters turned to very close collaborators, Mr. Victor Fillaos and his wife, to help in getting a priest who could celebrate Mass. 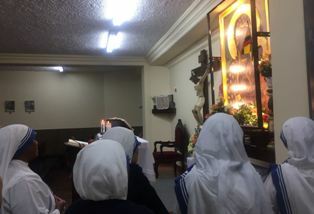 Father Rafael Amaya, of the Schoenstatt community, was ready and so the ladies and the sisters could be present at the Holy Eucharist and receive Holy Communion. There they learned that Our Lady the Black Madonna of Czestochowa intercedes for families and advocates for the unborn. They also learned that She is the Queen of Poland and that She was the one that Saint John Paul II would turn to for help and guidance throughout his life.